It’s time to check in with the pundits. No, not THOSE pundits. They’ve said enough already! We’re talking about the marketing communications types and what they see looming for 2017. While many are ecstatic about the potential for concepts such as virtual reality, programmatic buying, native advertising and chatbots, we thought we’d share a few of their more meat-and-potatoes thoughts. 1. Companies will continue to wake up to the concept of content marketing with a renewed focus on thought leadership. They also will seek out the right people and right schedule for creating quality content that resonates and sparks a conversation about their brand. 2. Millennials will continue to rule. From leveraging in-store apps to creating ads that cater to that generation’s collective mindset, marketers will be thinking young. 3. Companies will spend more on social media, personalizing content, focusing their messages to smaller groups and, increasingly, mining and analyzing data from social channels to better target and time their outreach. 4. About that outreach: Video will continue its tremendous growth as the go-to vehicle for messaging, and content is expected to improve. 5. Events marketing and promotion will increase, as companies join the crowds, speaking to them in their chosen venues. 6. Some companies will tackle the complicated task of reaching consumers through all of the electronic devices they use daily, especially smart phones, working to assure the messaging fits the medium. 7. Marketers shouldn’t let email fall by the wayside in the flurry of new media and devices that will continue to explode. 8. Bloggers will retain their importance as influencers in certain niches and should be a valued part of outreach in those areas. 9. While (good) writing remains important, graphic designers will take on a heightened role, as consumer preference for visuals (slideshares, infographics, etc.) over text continues to grow. There you have it: some areas of general agreement for navigating an ever-evolving marketing landscape. 10. 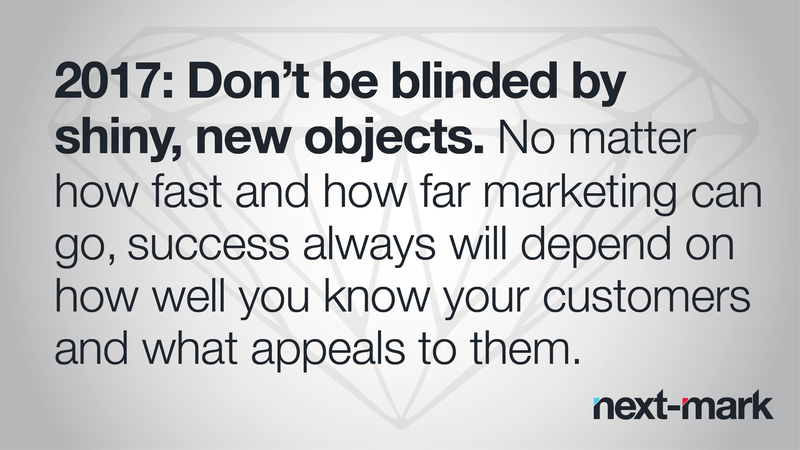 Prepare to see ongoing change in marketing media and techniques but don’t be blinded by shiny, new objects. The next big thing may not be the right thing for your organization. No matter how fast and how far marketing can go, success always will depend on how well you know your customers and what appeals to them.